The war weights heavily on my mind: these sodding elves are really starting to get me down. Huge bands of elven hunters and fawns are roaming the southern lands and I’m getting nowhere fast. So I venture out into the streets of Midgar to mingle with my people. In a bar, I happen across a strange old man with a strange old tale. I decide it’s worth the gamble and gain a map to the treasure, far, far, far into the southeast. I summon the adventurer Sidehelle and charge him with venturing out into the wilderness and claiming the treasure in the name of the Grigori. Meanwhile, reports are coming in that Melusine has been torturing the elven survivors from the segie of Brakkah and in the north, barbarians continue to attack Edge. In the east I find more dwarves, this time the Khazad, led by Kandros Fir. I suppose I have no choice but to say "Speak softly and carry a big axe." Towards the end of the Age of Magic, few Dwarves were seen by other races, and it was later said that deep in their under-hill holds, they didn’t notice the Age of Winter for three generations. Though this is almost certainly an exaggeration, while the kingdoms of men and elves withered under Mulcarn’s onslaught the dwarves grew slowly but steadily. Then one day their gatherers returned from the surface with reports of lush vegetation returning, and snow melting. 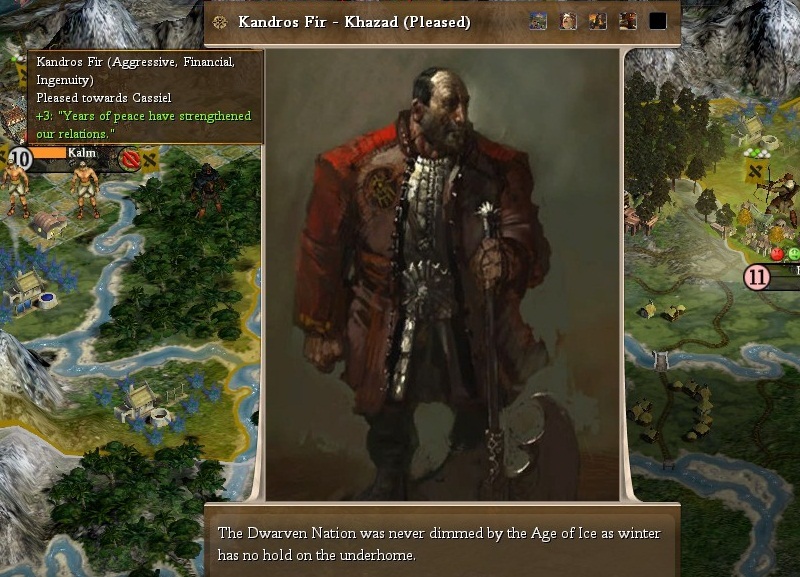 Kandros Fir led one group of Khazad out of their cavernous homes, to form cities and trade with the new kingdoms of men and of elves. He does not revere tradition as most Dwarves do; rather, he pioneered arts new to his people: negotiation, appraisal, marketing. 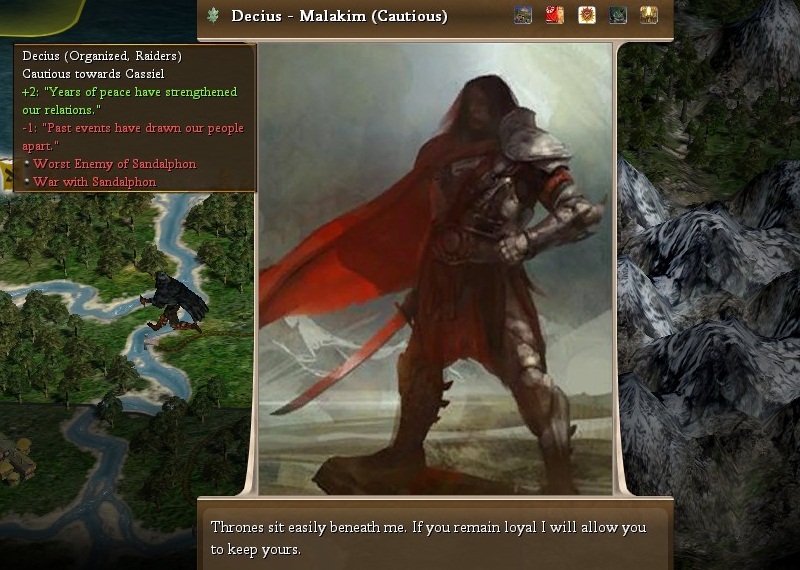 He persues trading partners with zeal, by force if necesary, always determined to advance the Khazad’s fortunes. Remembering the insults they were subjected to in generations past the Khazad are determined that they be secure as they venture out into the world. Not just the security of high walls and stout hammers, but of brimming coffers and judicious merchants. The dwarves are willing to trade and I gain knowledge of more magical disciples (necromancy and divination). These would probably be more useful to me if I had access to stronger mages. Still, the adepts that I do have are proving useful with their enchanted blade spell that grants +20% str to all units in a stack. I also have access to the spting spell that allows me to convert desert to plains. Which is handy as the small northern division of my army has captured a barbarian outpost in the deserts east of Edge. My foreign office also hears the terrbile news that Valledia the Even of the Amurites has fallen to an unknown enemy, and Luchuirp have finally conceeded defeat to the Svartalfar. Which means they’re now a vassal state and have declared war on me. Happy times these are not. Especially as the dwarves have summoned wood golems and are now patrolling the jungle south of Kalm. And now that Faeryl Viconia no longer has to worry about the Luchuirp she’s free to throw the full force of her army at Brakkah. I guess, on the plus side, the city wasn’t doing too well, what with constant elven rebellions, toturing, famine, etc. And Melusine’s forces did mange to kill a awfully lot of elves. A few turns later the might army lays seige to Kalm. Luckily the defensive terrain is enough for me to hold onto the city, although a large number of casualties are sustained on both sides. The handful of axemen who surive the attack set to work building a citywall to help secure their position: Kalm is all that stands between the winter elves and the heartland of Grigori. Unfortunatly, for Sinhelle, Decius is the last person he ever meets: while running away from goblin wolf riders, he stumbles into a giant spider lair. So much for that treasure.